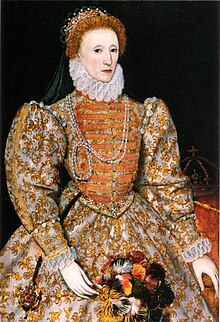 Elizabeth I of England (7 September 1533 – 24 March 1603) was the Queen of England and Ireland. She was queen from 17 November 1558 until she died in March 1603. She was also called "good queen Bess" or "the virgin queen" or "Gloriana". She was the daughter of King Henry VIII of England and Anne Boleyn, his second wife, and was the last of the Tudor dynasty of monarchs. When Boleyn was disgraced at court and executed, Elizabeth's life became a troubled one, including being locked up in the Tower of London, an old prison. Despite that, Elizabeth reigned with intelligence and hard work. Her reign was distinguished with great achievements in the arts, trade, and exploration. She ably defended her country through the days of the Spanish Armada. She never married, but had several favourites, including the Earl of Leicester. At her death in 1603, King James VI of Scotland was named her successor. Elizabeth was born in 1533 at Greenwich, England. She was the daughter of King Henry VIII of England and his second wife, Anne Boleyn. She had an older half-sister Mary, and, later, a younger half-brother Edward. Elizabeth was given a good education. She could speak and read six languages: her native English, as well as French, Italian, Spanish, Greek, and Latin. When she was thirteen and a half years old, on 28 January 1547, King Henry died. Elizabeth's half-brother, Edward, became King Edward VI of England. He died age 15. Mary succeeded him in 1553, and after Queen Mary's death in 1558, Elizabeth became Queen. Mary I had brought back the Roman Catholic religion in England. Elizabeth returned the nation to the Protestant faith made by her father. She did however retain some of the Catholic traditions. She wanted her subjects to make it look like they were being Protestant, even if they weren't. The years of Elizabeth's reign had many artistic achievements. William Shakespeare, Christopher Marlowe, Edmund Spenser, and other writers created enduring drama and poetry. Composers Thomas Tallis and William Byrd worked at Elizabeth's court. During her reign, many men sought adventure abroad. Sir Francis Drake, Sir Walter Raleigh, Humphrey Gilbert, and other "sea dogs" looted Spanish ships. They also sailed to the Americas. In 1580, Drake became the first Englishman to sail around the world. The expeditions of these men prepared England for an age of discovery and international trade and owning other parts of the world. In 1600, Elizabeth herself established a trading company known as the East India Company that became an important tool of the British Empire. England and Spain had long quarreled. Elizabeth encouraged Protestants in the Spanish-held Netherlands to rebel against Spain. She also encouraged her "sea dogs" to raid Spanish ships. In 1588, King Philip II of Spain sent an armada (a large fleet of ships) to invade England. 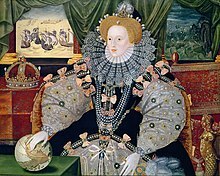 Elizabeth met her troops at Tilbury telling them: "I know I have the body of a weak, feeble woman; but I have the heart and stomach of a king - and of a King of England too." The Spanish Armada was met by England's smaller ships on 29 July 1588. They defeated the armada, which was further devastated by bad weather near Scotland and Ireland as the remaining Spanish ships returned to Spain. Elizabeth never married, and she had no children. However, she was fond of several noblemen in her court. 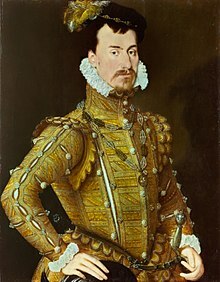 Prominent among these noblemen was Robert Dudley, the 1st Earl of Leicester. Later, she turned to Robert Devereux, 2nd Earl of Essex. He wanted to overthrow the government of the Queen. He was defeated and executed. Elizabeth died at Richmond Palace on 24 March 1603. The Protestant King of Scotland James VI became King of England. He was the son of her cousin Mary, Queen of Scots. 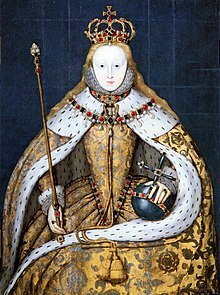 Elizabeth I was the last Tudor monarch, and reigned for 44 years. Her accession date was a national holiday for two hundred years.